After spending much of her life on stage, and doing a degree in performing arts – Laura McGoldrick first got into broadcasting in 2009. She hosted a children’s TV show called “Push Play” and after catching the eye of Sky Television, Laura started hosting “The Cricket Show”. As well as being a presenter for NZ Herald Focus, Laura fronts New Zealand cricket’s domestic league and international matches, co hosts “Holden Golf World” and presents from other major sporting events. 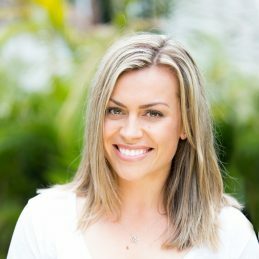 In 2013 she started working on Radio Hauraki’s breakfast show with Jeremy Wells and Matt Heath, she is now taking on a broader broadcast role within NZME. Laura is one of New Zealand’s most sort after MC’s and lists hosting the opening ceremony of the 2015 Cricket World Cup, The World Cup winning All Blacks 2015 Homecoming and the 2016 NZ Olympic Team Welcome Home at the Cloud as some of her career highlights. A proud Cantabrian, Laura is married to current Black Cap Martin Guptill, she still acts when she can and is a big fan of singing in the shower. Away from work, Laura’s passions are running, good wine, travelling and shoes. Her husband however, doesn’t love how much she loves shoes, and contrary to popular belief Laura and her husband don’t just talk about cricket all the time.